I BIKE TUSCANY! is a Florence-based company specializing in private or small group guided bike excursions around Florence, Siena, the Chianti and Val d'Orcia. These rides traverse back roads and easy dirt roads avoiding traffic. You'll ride to sites that only a local biker knows, as you won’t find them in any tourist guide. Our goal is to give you the opportunity to experience some really different and off-the-beaten track itineraries, cycling at your own pace on quiet country roads, past vineyards, olive groves and through quaint villages. Yes, there are hills (this is Tuscany after all!) but rest stops are frequent and you'll have plenty of time to enjoy the view from a hilltop and take pictures. If you love wine, at the end of the day, let us take you to a winery for a Chianti Classico wine tasting and a guided tour. If you visit Florence and you want to get away from the traffic, the crowd and the routine of the museums for just one day, we have a different, perfect way -- actually the best. 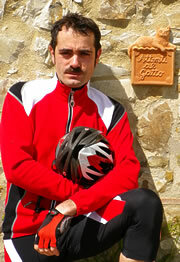 Florentine MARCO VIGNOLI, a former bicycle racer, founded I Bike Tuscany. 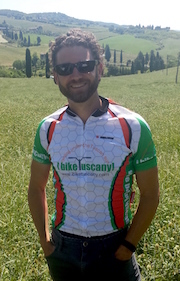 After years of working as a trip leader in Italy for a number of American based companies, he felt that it was time to start his own small, personalized business – for a very personalized service – in the region that above all others in the world seems to be made for cycling: Tuscany. ELIZABETH MILLER, manager for I Bike Tuscany, originally hails from Pennsylvania, where she grew up mountain biking, cross country skiing and hiking. In the late 1980’s she studied abroad in Milano, finished two undergrad degrees – a B.S. in Psychology and a B.A. in Italian Language/History, and then went on to complete a Masters in Italian Literature. She also instructed 5 credit undergrad courses in elementary Italian at the university level for several years. The call of Italy was irresistible and eventually she moved here permanently almost 20 years ago. Elizabeth continued bike riding and racing while in Italy and for three years straight was the Champion of Lombardy, both on and off road. She has been involved designing, managing and leading bike and Vespa trips throughout Italy for over 10 years – with over 125 week long vacations successfully completed. Elizabeth is also a certified professional sommelier, has consulted for a leading producer of Brunello di Montalcino, and reviews wines for Italy’s premier wine guide, DUEMILAVINI. Eli currently resides in the heart of Chianti Classico on a wine estate with her dog Sonny, enjoying the best biking roads and wines in the world every day. 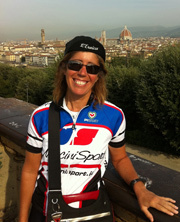 Elizabeth can’t wait to share her knowledge and passion for Tuscany, biking and wine with you. 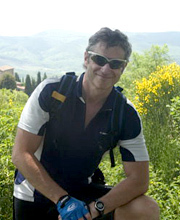 LORENZO DE' BENCI has collaborated as tour leader for “I Bike Tuscany” since 2005. Born in a small town near Cortona where he discovered his passion for cycling, he moved to Florence and became a professional bicycle mechanic for some of the most important shops and bicycle touring companies in town. He likes to consider Chianti and Val D’Orcia as his own backyard and he never misses a chance to ride there and enjoy local food, wine (of course!) and the amazing landscapes. ELENA BOSCHERINI was born in Verona, where she lived and worked until the beginning of 2012. Key Account, Sales Coordinator and Area Manager for 25 years, she practices sport for fun and sometimes for podium: 1st cat M1 in Triathlon MTB Tenno 2009, 2nd cat M1Triathlon Cremona 2009, 2nd Wteam Triathlon Iron Italian Championship 2009. She also loves travelling around the world for MTB events (Ruta de la Plata 2008, Patagonia 2009, Race Across Canada 2010, Mongolia Bike Challenge 1st edition 2010). Elena moved to Tuscany for love of Piero (her boyfriend! ), a bike shop owner in Florence, and collaborates with IBT since June 2012. 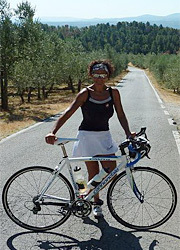 She can't wait to share with you her passion for cycling in Tuscany and her incredible risotto recipes! GRAHAM PLOWRIGHT first fell in love with Tuscany in the mid-90s and has since found it difficult to stay away for very long. A keen cyclist for the past 25 years, Graham's passion for his sport grew considerably while living in the heart of the Chianti. During his early days racing or training on the extraordinary roads around Siena his love for all things Tuscan was also born. He has since gone on to race competitively all over Europe and in Australia and still loves nothing more than challenging himself on the roads around Siena. Graham now divides his year between Sydney, Australia and a small village just north of Siena where he has been adopted by the locals and dubbed an honorary citizen. His locals-only knowledge of the area comes from his 20-year love affair with the region. Graham is, without doubt, cycling-obsessed and is also the proud owner of an impressive collection of new era and vintage bicycles. He is truly grateful for having the opportunity to share his passion with the people he escorts on our tours. Our single day excursions start at 9:00 am and end at approx. 4:30 pm including stops and lunch. Pick up and drop off are directly at your hotel in Florence or in the Chianti. Van transfer to the tour starting point.